Sorry for being away so long; I'd like to say that I've been really busy with work and other unpleasantries but truth be told, it was my birthday! Anyway, I wanted to share my fave birthday present which was gifted to me by my amazing boyfriend. Another pair to add to the collection! I've had my eye on them on Motel Rocks since they went live so was really chuffed to get them! They're so bloody high but amazingly comfortable- even more so than the Lita's, I would say; I think there's extra padding inside. I love them because they're a bit different. I find that the Lita has been copied to death and there are so many good fakes that sometimes I go out in mine and doubt that anyone knows the difference. These are really quirky; I love the curved heel, cut out back and the distressing around the toe. They're really unique. If they look a little scuffed it's because I'd already been out in them. Far too keen. 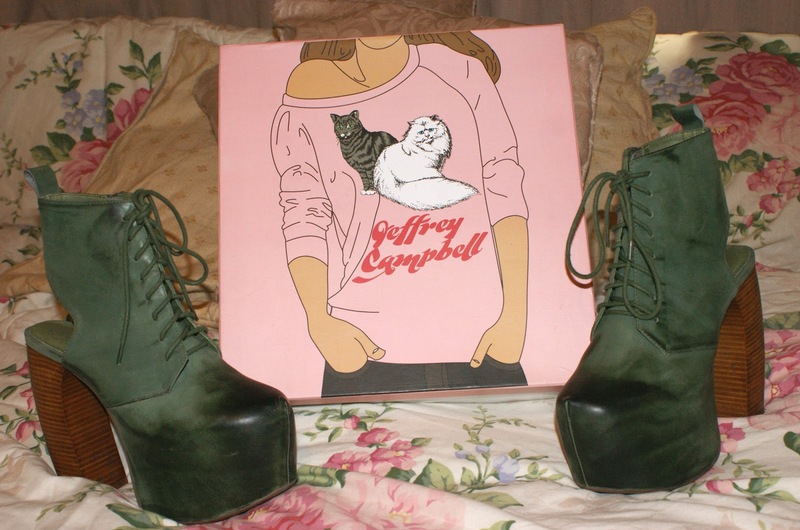 The Jeffrey Campbell shoe boxes are always so lovely with pretty illustrations on them. I wore them out on my birthday and lasted all night without blisters or having to limp, dance standing on the spot or taking them off- a feat rarely achieved by most of my other shoes! These are amazing!!! I've literally just stared at them for 5 minutes! I love Jeffery Campbell shoes but these are so individual and cool. They're gorgeous! I love the curved heel and the distressing on the toes, the colour is so gorgeous too! Ahhhh they are so beautiful! I've never seen the Lana style before! love your blog, I've just started following :) Nice to see a northern blogger!